Mysterious Relics are collectibles found in Donkey Kong Country: Tropical Freeze. 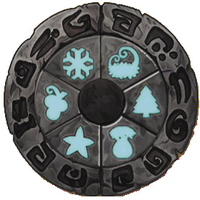 There are seven relics overall in the game, which together form a large plate. The main six fractions of the plate are located at the end of the temple level found in each world. A temple level opens once all of the K-O-N-G Letters in that world are collected. The final, center piece is obtained after beating Lord Fredrik and finishing the game. Once all of the Mysterious Relics have been gathered, the hidden seventh world, Secret Seclusion, is unlocked. The Kong Family receive a present box containing the last Mysterious Relic, after defeating Lord Fredrik. This page was last edited on February 19, 2018, at 19:50.